Over the years of his experience coaching at professional and international levels, Coach Dan Gaspar has collected an unbelievable amount of jerseys from the best players in the world. Enjoy viewing the jerseys and reading the corresponding stories of Dan's encounters with these phenomenal players. The Red Portugal National Team jersey is a Nike limited edition. All the 2010 Portugal World Cup Team players signed the Ronaldo jersey at the end of our training camp at Valley Lodge, Krugersdorp, South Africa. I was in the steam room during the 2010 World Cup in South Africa training camp Valley Lodge with the Portuguese legend Eusebio and Cristiano Ronaldo. Eusebio excused himself and left the steam room. I took this opportunity to ask Ronaldo, what motivates you? He said, “Winning”. I replied you have won everything, what really motivates you. He replied, “I want to be the best, the best of ALL TIMES”. That’s the difference, many want to be the best, but how many live everyday doing everything they possibly can to be the best of all times? That’s what motivates one of the greatest to produce magical moments. I’ve been blessed to work on 4 different continents with elite professional clubs and prestigious National Teams. These experiences allowed me to work with and be exposed to world-class players and coaches.The Figo jersey was the first jersey I obtained. It was this jersey that stimulated me and began my interest in starting the collection. 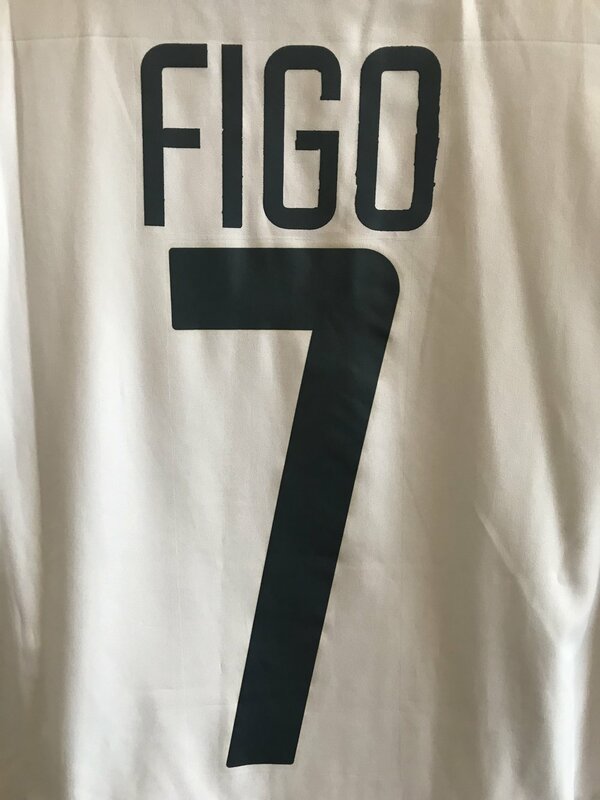 Figo offered this particular jersey to me in 1993 during my first time with the Portugal National Team. All the players signed it as well. Figo is considered one of the best number 7’s to have played the game. Recognized for his creativity and ability to take players on. He is regarded as one of the greatest players of his generation. He continues to be a tremendous ambassador for the game. Despite his outstanding success he is a humble gentleman with tremendous character and class. I am fortunate that we continue to remain in contact. I had the honor of working a long side Glenn “Much” Myernick with the US Olympic Team and U17 US National Team. Glenn was a Top Class coach and an amazing human being. He passed away much to early on October 9th, 2006 at the age of 51. 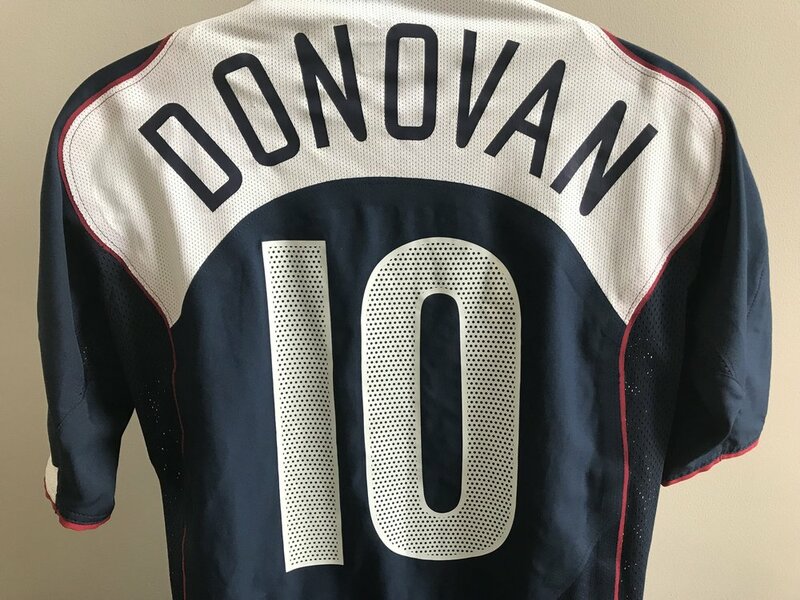 We all miss him.Glenn was aware of my passion in collecting jerseys and he was very generous in giving me Landon Donovan’s signed jersey by the US National Team players. Landon Donovan is regarding as the greatest American men’s soccer player of all times. He holds numerous records in MLS and the US National Team. He is the all time leading goal scorer and assist leader for both the MLS and US National Team.He played for Bayer Leverkusen, Bayer Munich, Everton, and LA Galaxy and currently for Leon in Mexico. As an Assistant Coach of the 1996 MLS MetroStars I had the pleasure to work with and observe the incredible Roberto Donadoni. Of the many great players I’ve been fortunate to be exposed too, Donadoni with no hesitation is one of the most hard working and complete professionals I’ve witnessed. Outstanding character. Was a fantastic role model and leader to all the players on the roster. Despite being at the end of his career when he joined the Metrostars he was one of our fittest players. It was an honor for me to receive his signed jersey. He played for Milan, MetroStars and Ithihad. As a player he represented Italy 63 times and coached them as well in the Euro 2008 to the quarterfinals. Iran played Chile on 3/26/15 in Austria. Iran’s historic 2 - 0 win was an impressive victory over Chile who was ranked in FIFA’s Top 10. After the match, the Chilean Team Manager approached me and said, “I have a Sanchez’s jersey signed by all the players, but I need three Iran National Team jerseys. I only had one! So I sprinted into our locker room and persuaded our Equipment Manager to give me 2 more jerseys. These moments happen in a blink of an eye. You need to attack at the right moment. It does make a difference when you are on the technical staff! Sanchez played on the following teams Udinese, Colo-Colo, River Plate, Barcelona, Arsenal and is currently playing for Manchester United. Represented his country 119 times and is the all-time leading goal scorer and international caps holder. Against Deportivo La Coruna, Lionel Messi nets hat trick as Barcelona claim La Liga title! As a tribute to one of the greatest I thought today would be appropriate to post his signed jersey.The football world would never forget when Iran played against Argentina in the 2014 Brazil World Cup. It took four time FIFA World Player of the Year Lionel Messi to score a brilliant goal in extra time to give Argentina a 1 – 0 victory over Iran to avoid an historical major upset. Number 10 broke the hearts of a nation. 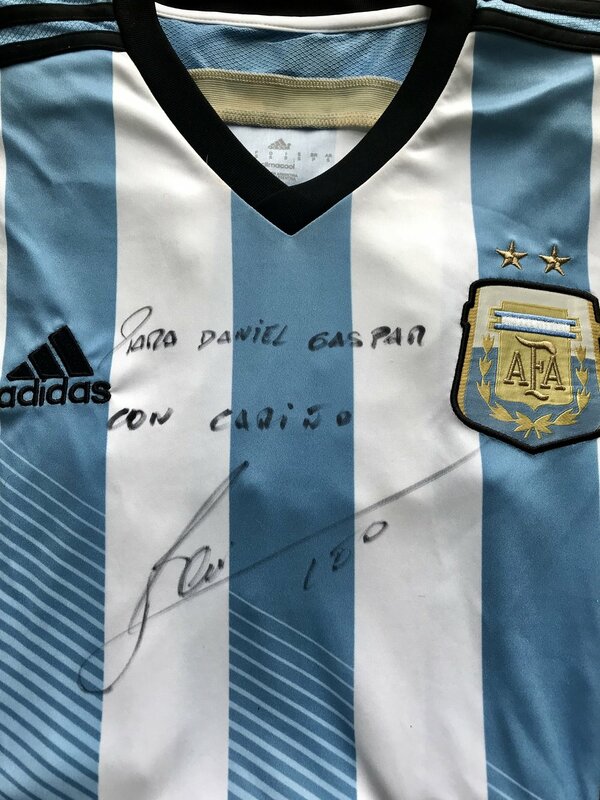 In respect to privacy I will only share that it was an Argentina Fitness Coach who was able to utilize his contacts and offer this signed jersey by Messi as a gift to me. Network is key to collecting jerseys. I am grateful to have this special jersey as part of my collection. Lionel Messi is often considered one of the best players of all times. He had a record tying five Ballon d’Or awards and record tying four European Golden Shoes. His entire career has been spent with Barcelona. It’s very rare to find these days players with loyalty to one club. He has wan 32 trophies. Both a prolific scorer and a creative playmaker. Messi is the all-time leading goalscorer for the Argentina National Team and La Liga. Has represented his country 123 times, scoring 61 goals.